Distributed Denial of Service (DDoS) attacks are attempts by a malicious actor to flood a network, system, or application with more traffic, connections, or requests than it is able to handle. To protect your web application against DDoS attacks, you can use AWS Shield, a DDoS protection service that AWS provides automatically to all AWS customers at no additional charge. You can use AWS Shield in conjunction with DDoS-resilient web services such as Amazon CloudFront and Amazon Route 53 to improve your ability to defend against DDoS attacks. Learn more about architecting for DDoS resiliency by reading the AWS Best Practices for DDoS Resiliency whitepaper. You also have the option of using Route 53 with an externally hosted content delivery network (CDN). In this blog post, I show how you can help protect the zone apex (also known as the root domain) of your web application by using Route 53 to perform a secure redirect to prevent discovery of your application origin. When browsing the Internet, a user might type example.com instead of www.example.com. To make sure these requests are routed properly, it is necessary to create a Route 53 alias resource record set for the zone apex. For example.com, this would be an alias resource record set without any subdomain (www) defined. With Route 53, you can use an alias resource record set to point www or your zone apex directly at a CloudFront distribution. As a result, anyone resolving example.com or www.example.com will see only the CloudFront distribution. This makes it difficult for a malicious actor to find and attack your application origin. You can also use Route 53 to route end users to a CDN outside AWS. The CDN provider will ask you to create a CNAME alias resource record set to point www.example.com to your CDN distribution’s hostname. Unfortunately, it is not possible to point your zone apex with a CNAME alias resource record set because a zone apex cannot be a CNAME. As a result, users who type example.com without www will not be routed to your web application unless you point the zone apex directly to your application origin. The benefit of a secure redirect from the zone apex to www is that it helps protect your origin from being exposed to direct attacks. The following solution diagram shows the AWS services this solution uses and how the solution uses them. A user’s browser makes a DNS request to Route 53. Route 53 has a hosted zone for the example.com domain. If the request is for the apex zone, the alias resource record set for the CloudFront distribution is served. If the request is for the www subdomain, the CNAME for the externally hosted CDN is served. CloudFront forwards the request to Amazon S3. S3 performs a secure redirect from example.com to www.example.com. Note: All of the steps in this blog post’s solution use example.com as a domain name. You must replace this domain name with your own domain name. Route 53 – This post assumes that you are already using Route 53 to route users to your web application, which provides you with protection against common DDoS attacks, including DNS query floods. To learn more about migrating to Route 53, see Getting Started with Amazon Route 53. S3 – S3 is object storage with a simple web service interface to store and retrieve any amount of data from anywhere on the web. S3 also allows you to configure a bucket for website hosting. In this walkthrough, you will use the S3 website hosting feature to redirect users from example.com to www.example.com, which points to your externally hosted CDN. 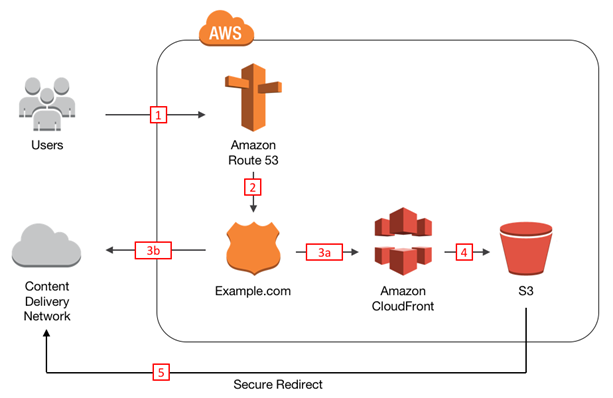 CloudFront – When architecting your application for DDoS resiliency, it is important to protect origin resources, such as S3 buckets, from discovery by a malicious actor. This is known as obfuscation. In this walkthrough, you will use a CloudFront distribution to obfuscate your S3 bucket. A Route 53 hosted zone for your domain. A CNAME alias resource record set pointing to your CDN. Create an S3 bucket with HTTP redirection. This allows requests made to your zone apex to be redirected to your www subdomain. Create and configure a CloudFront web distribution. I use a CloudFront distribution in front of my S3 web redirect so that I can leverage the advanced DDoS protection and scale that is native to CloudFront. 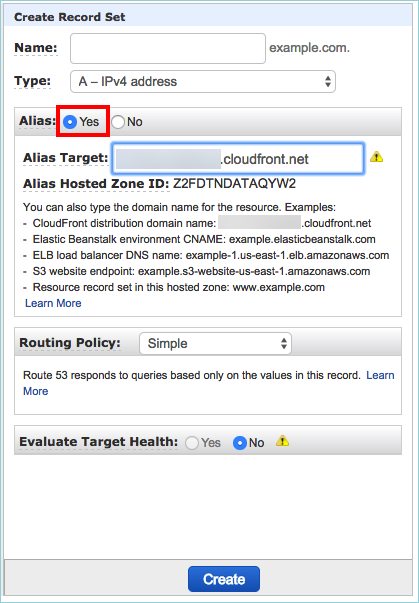 Configure an alias resource record set in your hosted zone. Alias resource record sets are similar to CNAME records, but you can set them at the zone apex. Validate that the redirect is working. Open the AWS Management Console. Navigate to the S3 console and create an S3 bucket in the region of your choice. Choose the S3 bucket you just created and then choose Properties. Choose Redirect all requests to another host name, and type your zone apex (root domain) in the Redirect all requests to box, as shown in the following screenshot. Note: At the top of this tab, you will see an endpoint. Copy the endpoint because you will need it in Step 2 when you configure the CloudFront distribution. 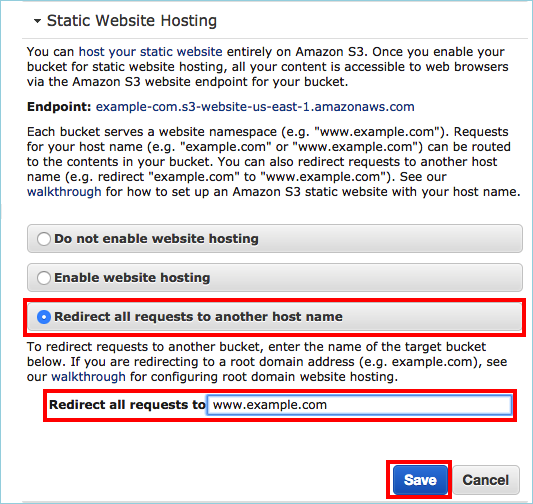 In this example, the endpoint is example-com.s3-website-us-east-1.amazonaws.com. From the AWS Management Console, choose CloudFront. Origin Domain Name –When you click in this box, a menu appears with AWS resources you can choose. Choose the S3 bucket you created in Step 1, or paste the endpoint URL you copied in Step 1. In this example, the endpoint is example-com.s3-website-us-east-1.amazonaws.com. Alternate Domain Names (CNAMEs) – Type the root domain (for this walkthrough, it is www.example.com). Wait for the CloudFront distribution to deploy completely before proceeding to Step 3. After CloudFront creates your distribution, the value of the Status column for your distribution will change from InProgress to Deployed. The distribution is then ready to process requests. From the AWS Management Console, choose Route 53 and choose Hosted zones. On the Hosted zones page, choose your domain. This takes you to the Record sets page. Leave the Name box blank and choose Alias: Yes. 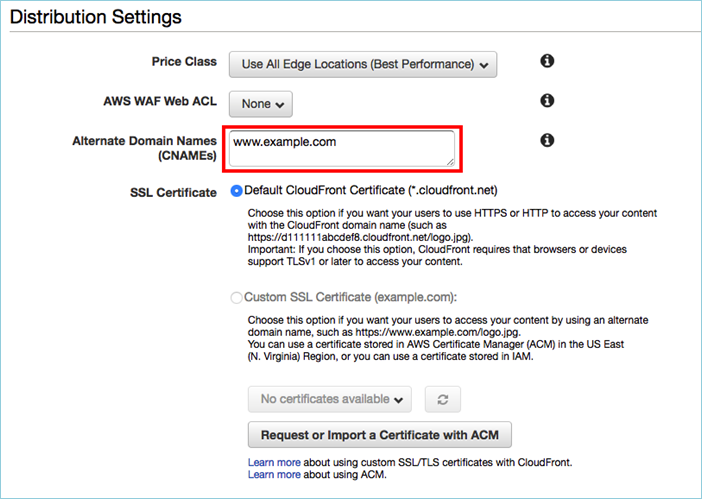 Click the Alias Target box, and choose the CloudFront distribution you created in Step 2. If the distribution does not appear in the list automatically, you can copy and paste the name exactly as it appears in the CloudFront console. To confirm that you have correctly configured all components of this solution and your zone apex is redirecting to the www domain as expected, open a browser and navigate to your zone apex. In this walkthrough, the zone apex is http://example.com and it should redirect automatically to http://www.example.com. In this post, I showed how you can help protect your web application against DDoS attacks by using Route 53 to perform a secure redirect to your externally hosted CDN distribution. This helps protect your origin from being exposed to direct DDoS attacks. If you have comments about this blog post, submit them in the “Comments” section below. If you have questions about implementing the solution in this blog post, start a new thread in the Route 53 forum.